Home › videos › She Poses For A Selfie With Her Big Horse. But Look Closely At His Mouth... HILARIOUS! She Poses For A Selfie With Her Big Horse. But Look Closely At His Mouth... HILARIOUS! Who knew horses could be so cuddly? 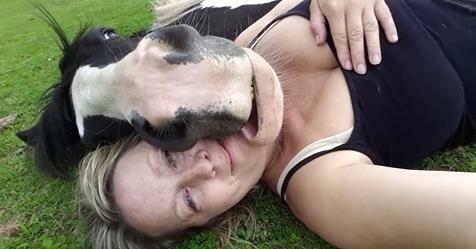 A horse comically named Jimmy the Cow, appropriately a tongue-in-cheek name, loves his “human pillow” and isn’t afraid to show his affection with smooches, cuddles and lovable licks! In a hilarious video, Jimmy is lying down next to a woman (who is also lying on her side) and is literally cheek to cheek with her! What a flirt! Horses can be huge love bugs as we have seen when a cute little girl scratches a pony’s back and he returns the favor, and how horses show their trust and affection by helping disabled athletes through competitive sports. While cuddling with her, his huge lips hang over half of her face. Oh, but that’s not all — then his tongue comes out and he licks her face as the woman is hysterically laughing. His nostrils flare as he cuddles up to his newfound friend. He looks so relaxed, content and at peace. You can even catch a glimpse of his huge teeth, which looks like he’s smirking and smiling. Too funny! “Have you ever seen a bigger baby?! I love this!” commented one Facebook user. Another funny thing to note is that if you look closely, you can see tiny whiskers on the horse’s chin, which makes it look like he could use a shave… Or maybe he’s looking to be more rugged and have a bad boy image!